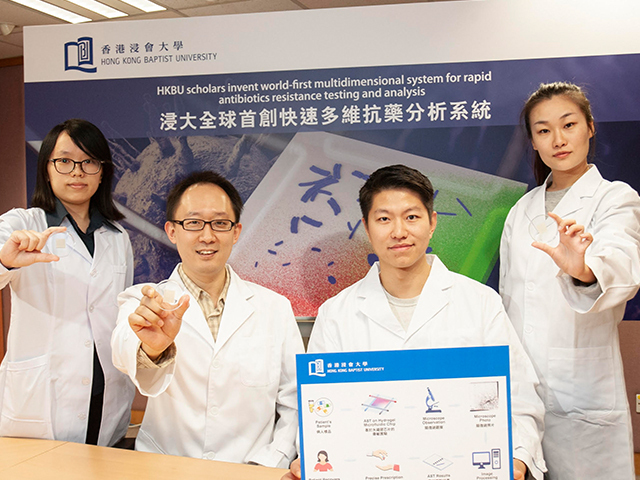 Researchers from the Department of Chemistry at Hong Kong Baptist University (HKBU) have invented the world’s first multidimensional antimicrobial susceptibility testing (AST) system. The new technology can provide information about drug resistant pathogens present in patients, enabling doctors to accurately determine the effectiveness and appropriate dosage of antibiotics needed for effective treatment. 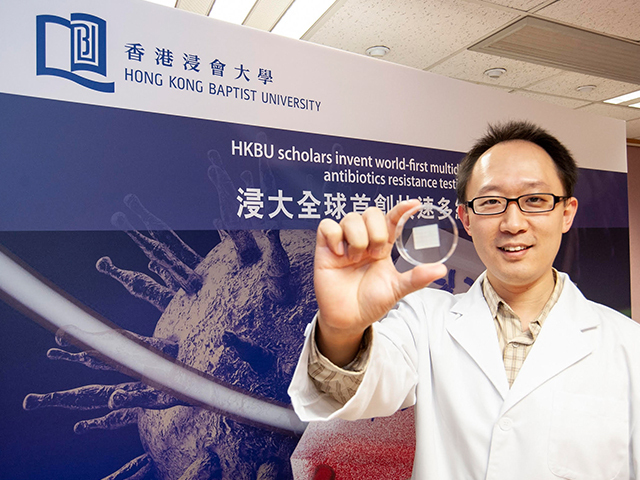 In order to accurately test and analyse antibiotic resistance, the team fabricated a hydrogel microfluidic chip which simulates the drug diffusion process and the killing of pathogenic bacteria inside the human body. The system is simple to operate and only requires a small amount of the patient’s body fluid, such as blood or saliva. Once unwanted substances have been removed, the sample fluid is placed on the chip, and is then treated with different antibiotics. After about four hours, the system indicates the effectiveness of the antibiotic treatment and whether it is needed. Due to the chip’s multidimensional properties, multiple variables can be introduced simultaneously, such as different antibiotics, nutrients and immunologic substances. 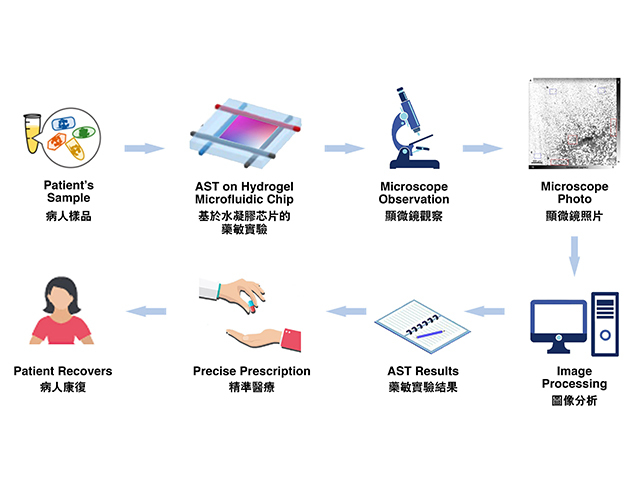 Automated microscopic observation of bacterial growth also enables users to determine the most appropriate type, or the best combination, of different types of antibiotics and the required dosage for treatment. The research team is led by Dr Ren Kangning, Assistant Professor in the Department of Chemistry at HKBU. The team members include PhD students Sun Han, Chan Chiu-wing and Hu Chong, MPhil student Wang Yisu, Research Assistant Liu Zhengzhi, and Professor Niaz Banaei, Director of the Clinical Microbiology Laboratory at Stanford University, USA. Dr Ren said that currently clinical doctors assess a patient’s suspected bacterial infections according to his/her experience. They then decide whether to prescribe antibiotics, tailoring the treatment and type of antibiotic to be applied accordingly. If the patient does not recover having taken the medicine, the doctor will reassess or use another antibiotic. Currently there are ASTs available for doctors to assess the patients’ antimicrobial susceptibility but it takes a few days to obtain the results. Dr Ren explained that as the new system employs microfluidic technology, compared with the existing AST methods, its accuracy is not only higher, but it also requires much smaller samples and takes significantly less time to carry out tests. In addition, the synergistic effects of multiple drugs and the dynamic changes of different substances in the human body can also be simulated. The ability to automate the test can reduce possible errors from human manipulation and observation too. Quoting a World Health Organization (WHO) report, Dr Ren said that if humans do not take timely countermeasures, antimicrobial resistance will gradually accelerate. The WHO estimates that around 300 million people will die due to drug-resistant microbes in 2050, leading to serious economic losses around the world. Dr Ren said that the development of new antibiotics takes an average of 10 to 20 years, in addition to the large amount of money required. Existing antibiotics have also begun to weaken or even fail to kill some bacteria. This new method can slow down the process of antimicrobial resistance and help to prevent the formation of “superbugs”.